It’s the sort of place you’d enjoy if you’re nearing 30 or past 30 or if you just like quiet places, where you don’t just sit with your friends to booze aimlessly and reach home somewhat unconscious. Haven’t you heard of the 30s syndrome? It’s probably when you prefer sleeping early or when you don’t really look forward to boisterous pubs where you can’t hear your own voice. A small peg of liquor or a pint of beer works best or no peg either – after all you have to drive back home and you don’t want to mess with Delhi’s incorrigible cops. Delhi’s Café Lota is one such place where the food – a sumptuous assortment of north and south Indian cuisines – is good (and healthy and arguably affordable); and there’s no loud music either, save for the minimal All India Radio instrumental recitals in the background. The lighting is dim, the seating spacious. Ample pots of embers are kept next to tables to keep you warm in winters. The venue effectively drowns out the noise of traffic outside. If you’re a metro person, get off at Pragati Maidan station and take an auto rickshaw to Crafts Museum (across Bhairon Mandir) for 40 rupees and no more. Lota is an unusual name, isn’t it? A lota would be a steel/brass/copper container that you would use to drink water from, or bring milk from the nearby dairy or a permanent fixture with a yogi or anyone who doesn’t own a toilet and has to go behind the bushes for the first morning call. A souvenir shop at the museum is called ‘Lota’, and hence the name for the cafe, a waiter there told me. The cafe opened in 2013. 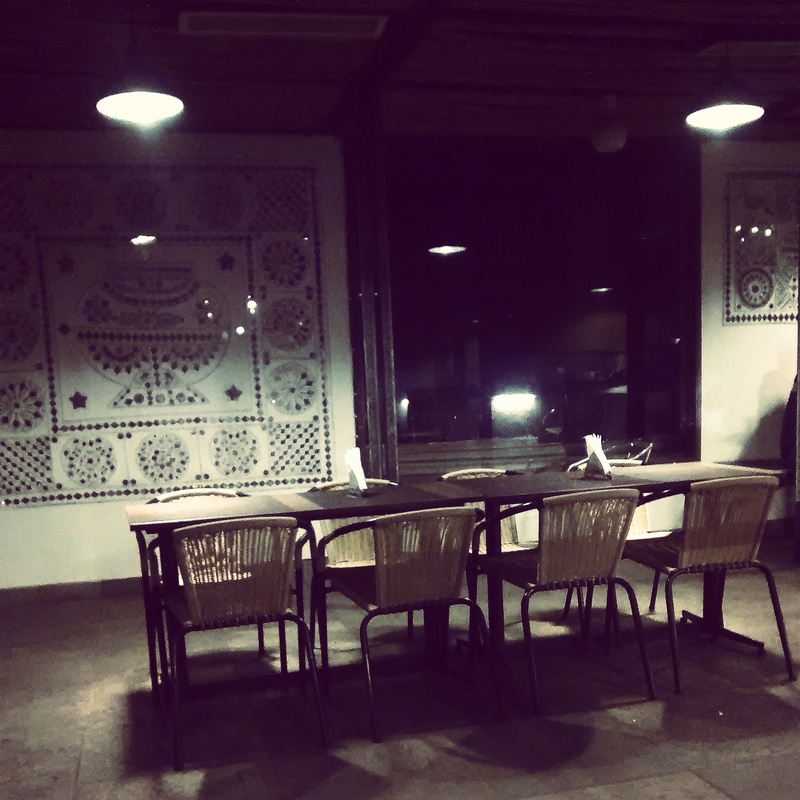 When I entered the museum on a cold Friday evening, I walked into a dark alley that took me to a sparsely lit dining area that is now famous in Delhi as Café Lota. Restaurant search provider and reviewer Zomato has listed it under its hidden gems collection. It’s funny how the sound of conversations on dining tables didn’t spill over to the rest of the restaurant, a likely scenario in Delhi’s dining areas. In front of my table, a group of friends quietly ate Palak Patta Chaat (which has crispy spinach leaves, potatoes and chickpeas topped with spicy yoghurt and chutneys). In other words, an expensive version of your street side chaat papdi, served in a big porcelain plate. Lovers idled away elsewhere, engrossed – platonically only, thankfully – into each other rather than the food; two girls giggled in a far corner. I liked the craft work on the white wall, enhanced by the yellow light. The interior – if you can call it that – is tasteful in its austerity. 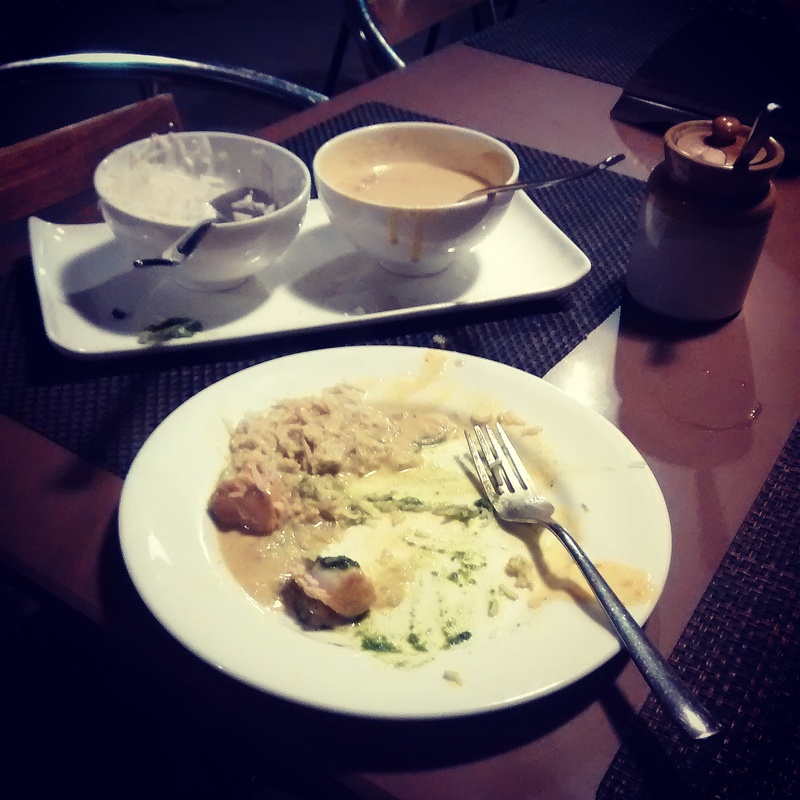 I had Pondicherry fish curry with steamed rice, which reminded me of Thai curry. While the sole fish was prepared just the right way, the rice could have been cooked more and the portions should have been bigger for a plate for 400 rupees. *Apple cinnamon jalebi – I hate the smell of cinnamon until I had this! Highly recommended. “Another delightful dish was the chicken ghee roast, or boneless chicken coated in a red paste made of curly red chili peppers from the south Indian Konkan region,” they write. The Hindu reporter ordered a plate of Amritsari fish (batter-fried sole, coated with popped amaranth seeds, served with sweet potato chips); Gujarat khichri (with sweet and sour kadhi); and bhapa doi (a Bengali sweet dish). Looks like the café deserves not one, but many more visits. And by the way, early risers – this place opens at 8 a.m. The café is closed on Mondays.